Zhejiang Sandi Electric Co., Ltd is an international PV enterprise which is located in the "capital of China's electrical appliances" Wenzhou. Specialized in the new energy source and electrical source scientific research, development, manufacture and service had surpasses for 15 years. Sandi company's products are widely applied in solar or wind energy, construction, industry, new energy source, civilian use, electric power, medical treatment, aviation, automatically control system of war industry and national heavy engineering project. 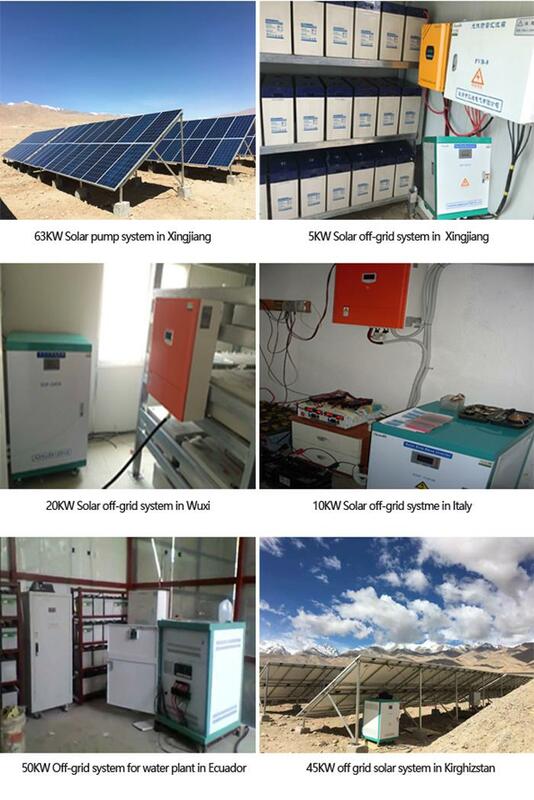 Main products: PV Grid-connected inverter, off grid pure sine wave inverter, solar pump inverter, PV array combiner box, solar charge controller, wind-solar hybrid controller, single phase to three phase converter, AC-DC Charger and etc products. 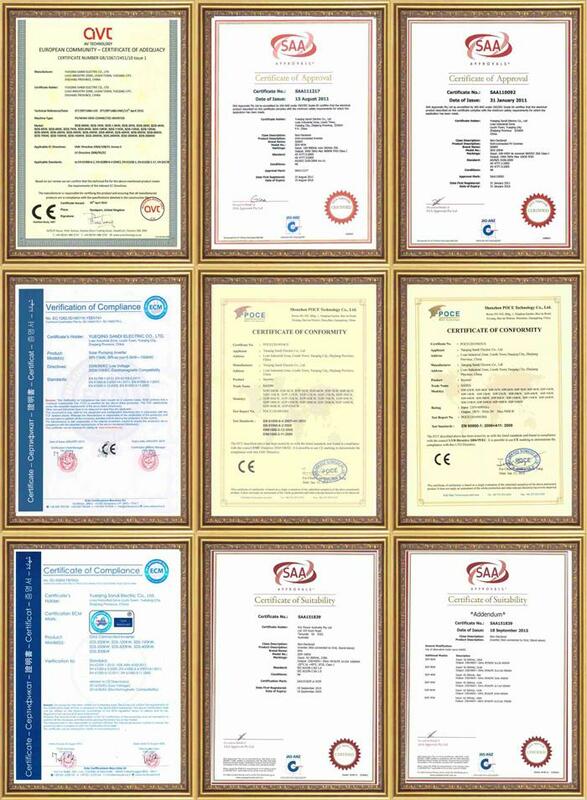 Sandi is recognized by widely customers according to entirely varieties, high quality and service first. The R&D and engineering technicians have multi-year experiences in product design, product implementation, engineering service and can manufacture the solar energy generation products with the international competition capability reaches advanced level in the world, our product have passed CE(EMC&LVD), SAA(AS4777&AS3100), G83/1, G59, VDE ARN 4105 and ISO9001 certification and approved by international standard. SANDI Electric Company insist on technology as forerunner, keep long-term, good research cooperation with all universities; fetch in and absorb international advanced technology, built strictly quality control system. We will take the work objective of “unremitting exploration, endeavor and innovation, honesty and dedication, perfect and practicality” and quality guideline of “criterion management, intensive manufacture, quality first, service with all hearts”. Seek excellence, value innovation! We will ceaselessly struggle and create refulgence with you together. 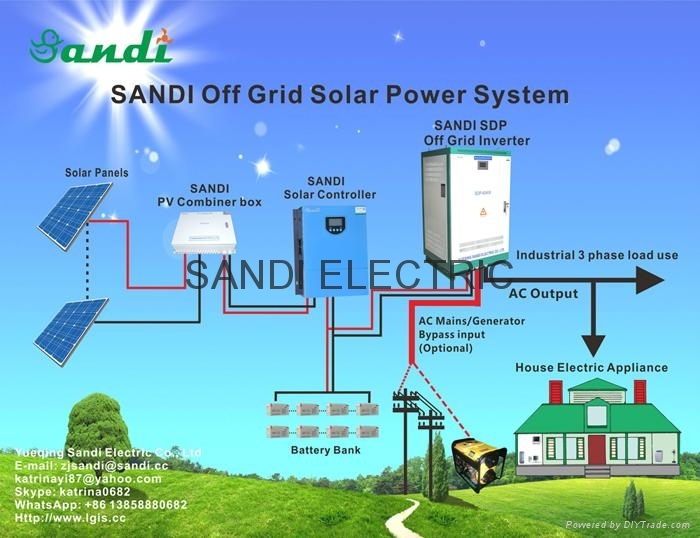 SANDI PV Off-grid Solar power generation system including solar panel array, PV combiner box, solar charge controller, storage battery, Off-grid inverter, etc. In the sunshine, the solar panel convert the solar energy to DC power and charge the battery group by the charge controller. Then the off grid inverter convert the DC power into AC power for power supply the AC load. Solar system can be designed according to different applications including, houses, buildings,company,factory,farm, water pump,lighting.The system is designed automatically switch to grid power when battery power off ,then grid power will charge battery.When grid power not availabel,can switch to run on desiel generator so as to continue water pump irrigating or other application. Welcome to inquiry, if there any product meet your requirements, pls feel free to contact us in the first time, Thank you! Company Name : Zhejiang Sandi Electric Co., Ltd.